ATLANTA, GA--(Marketwire - Feb 8, 2012) - Cinnabon® bakeries are now serving up the world famous cinnamon roll flavor in coffee. Now through May 20, Cinnabon Flavored Coffee Chillatta® and Cinnabon Flavored Iced Coffee are available at participating bakeries. The Cinnabon Flavored Iced Coffee has hints of brown sugar, vanilla and Makara® cinnamon, making it the most bon-like coffee yet. The Cinnabon Flavored Coffee Chillatta is a frozen, blended beverage that contains Makara cinnamon and vanilla flavors blended with a ribbon of caramel and topped with whipped cream. "These new specialty beverage flavors give our guests an additional opportunity to enjoy the Cinnabon flavor they love," said Kat Cole, president of Cinnabon. 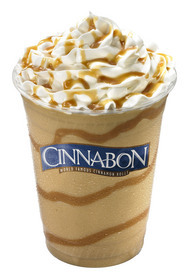 "Whether it is blended or over ice, the Cinnabon coffee flavor is sure to 'wow' taste buds." The suggested retail price of the Cinnabon Flavored Iced Coffee is $1.99 (16 oz.) and $2.29 (24 oz. ), and the Cinnabon Flavored Coffee Chillatta is $3.99 (16 oz.) and $4.49 (24 oz.). For more information about Cinnabon, visit the company's website at www.cinnabon.com. Founded in Seattle in 1985 and now based in Atlanta, Cinnabon, Inc. is the market leader among cinnamon roll bakeries. The company serves fresh, aromatic, oven-hot cinnamon rolls, as well as a variety of other baked goods and specialty beverages. Cinnabon currently operates more than 800 franchised locations worldwide, primarily in high traffic venues such as shopping malls, airports, train stations, travel plazas, entertainment centers, academic institutions and military establishments. Visit www.cinnabon.com for more information, follow us on Twitter @CinnabonInc or become a Facebook fan at http://www.facebook.com/Cinnabon.